My European teammates looked at me, determined, dependent on my expertise. 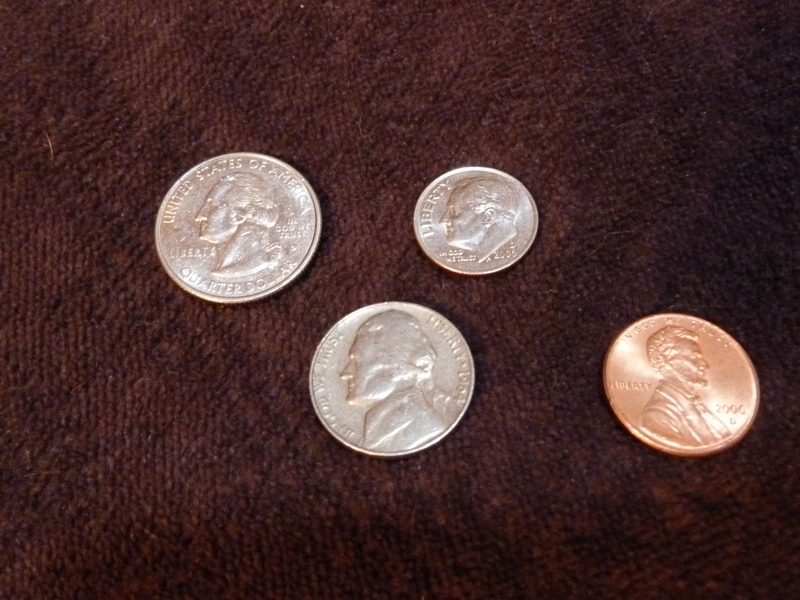 My brain reeled–I hadn’t thought about money in terms of American coins for almost a year. Maybe more–who used coins anymore? It was July, and I was on vacation in Cairns, Australia, one of the only Americans there—and here, in my hostel-wide trivia contest, I was the only one. Sweet. I double-checked my math, nodded, and announced my result: “72 cents.” They scribbled down my answer and we moved on to the next question. Thank goodness my knowledge of the absurdity of American coinage hadn’t completely left me. Actually, if anything, it’d gotten stronger. Roaming about the world this last year, I have come to realize that America has a strange sort of relationship with cash. We use it less and less, and yet we go into conniption fits if someone suggests that, say, we eliminate the scarcely-used and cost-inefficient penny. As a traveler, I’d go to a country, exchange some money, and then go about paying for everything in cash–20 NTD here, 30 baht there, with $1.50 AUD and ¥ 200 spent along the way. Sure, I had a credit card–and a debit card, in Taiwan, where I was living–but I used them only as a last resort. Coins jingled wherever I went, and I got well-used to knowing how much money I had handy based on the weight of my wallet. 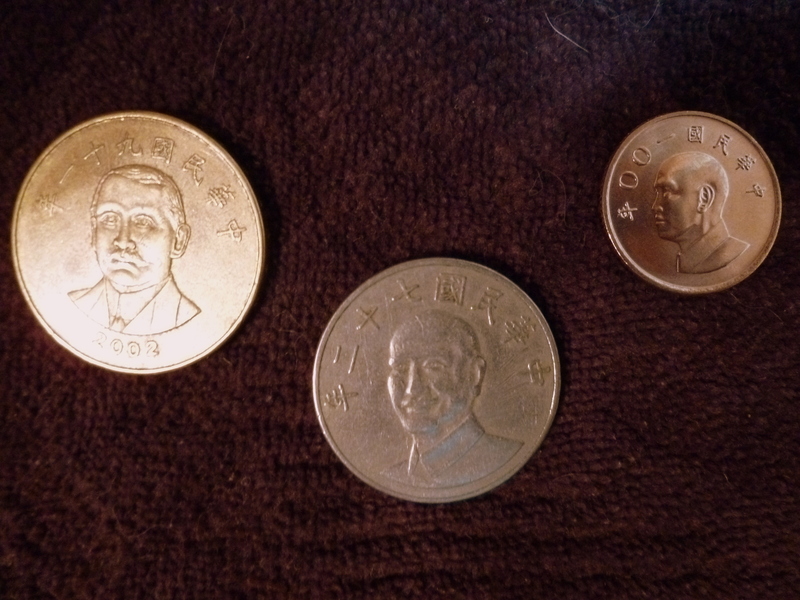 In Taiwan, there was the hefty brass 50 coin, which could always be counted on to buy a nice tea, or a meal at Chialing’s or Ali’s, and the slick silver 10 coin, two of which could usually snag a nice 7-11-brand drink, or more, if paired with a few of the smaller 5 coins or penny-lookalike 1 coins. A vast number of my purchases revolved around some combination of these four, and my daily routine included rooting around in my coin purse trying to make exact change, or else wondering where all of my coins had gone and reluctantly handing over a bill. Money had a sound, and a weight, that I knew. Then I came home. I knew, academically, of course, that I had been using cash much, much more abroad than I ever had in America. (Because, again who uses cash in America??) What I hadn’t realized was how that fact would skew my new image of American coins. In essence, they’re puny. And insignificant. 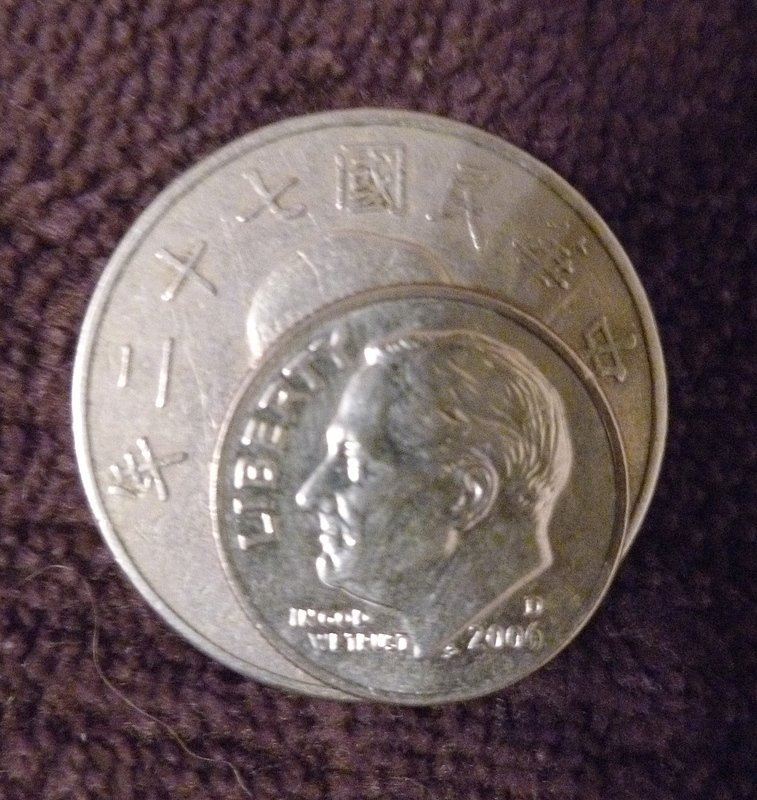 Out of Taiwan-born habit, I’ve handled a fair amount of cash since coming home, and every time I go for my coins, I have a mini heart attack as I pick up a quarter and nearly fling it off the table for its sheer lightness. Money is supposed to weigh more than this! My subconscious screams at me, assuring me that the piece in my hand cannot possibly be worth more than one or two cents. 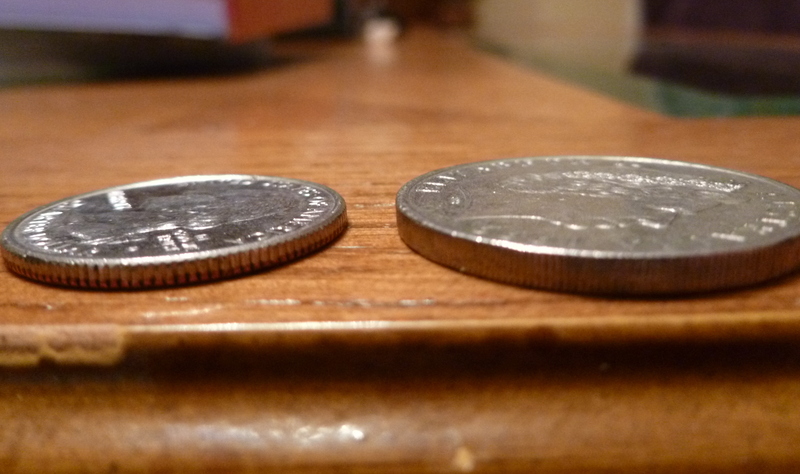 It’s jarring, and unpleasant, and just plain weird–did American coins decide to go on a starvation diet while I was gone? Or have they really always been this small? 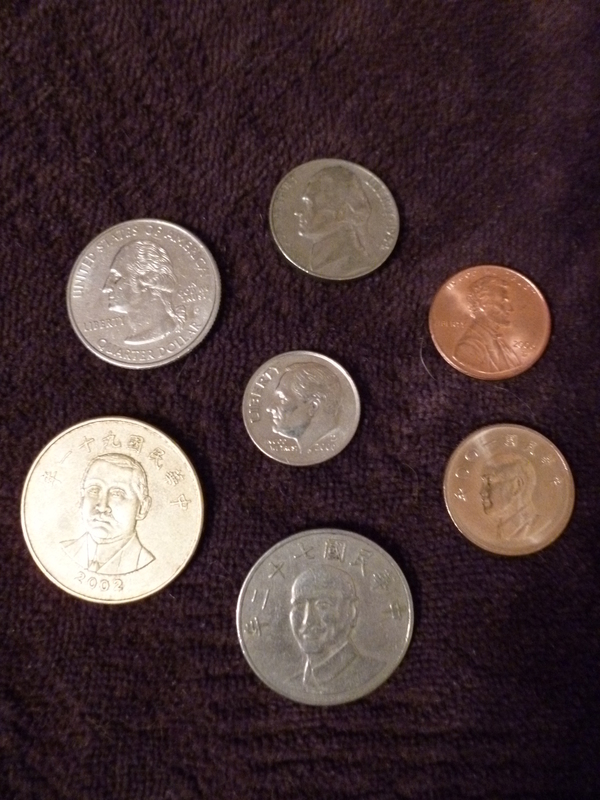 I seem to have spent all my 5s before leaving the country…see, usable coins! Now let’s take a look at it in relation to a few other currencies I happen to have picked up this year. 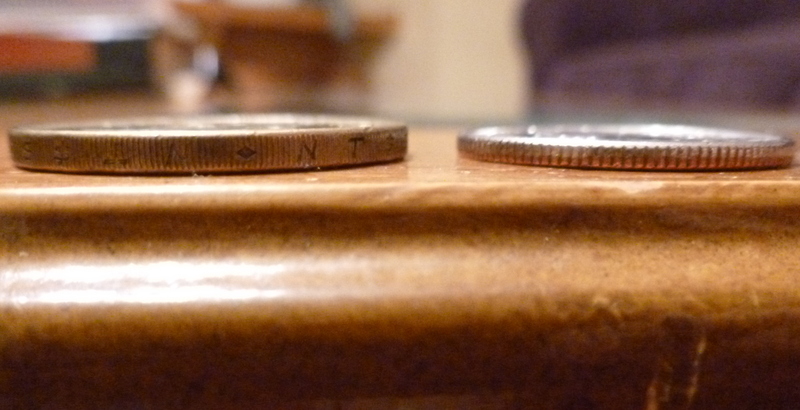 Here’s the difference I can’t seem to get my head around–the quarter vs. the 50 NT coin. 10s…which do YOU want to carry? 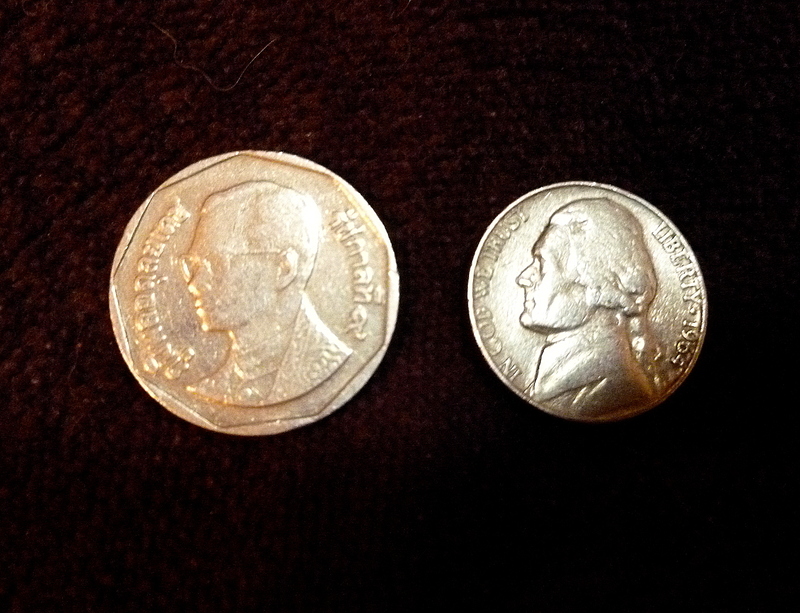 These coins are worth nearly identical sums–25 cents American and 20 cents Australian. So why is one dwarfing the other??? OK, so American money may have more heft here. 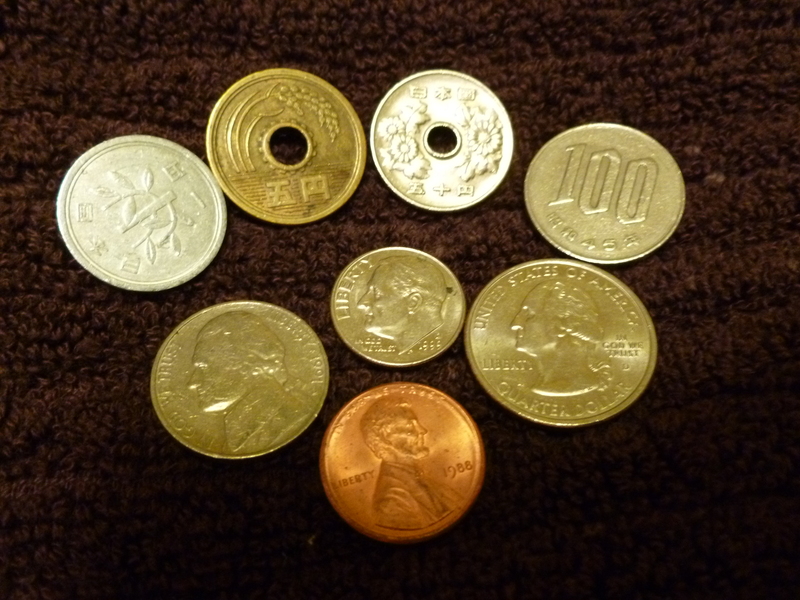 But Japanese money has more useable amounts, AND they have holes in the middle. Pretty cool. The punyness is not my imagination. And, size aside, it’s no wonder no one uses them, because they have next to no useability. In Taiwan, it made sense to pay for a snack purchase with coins, because you could usually do so with, say, a 50 and a 10. Assuming roughly equivalent prices (which is a pretty accurate assumption, if you’re talking about imported junk food) and an exchange rate of 30NT to $1 US (which is also pretty accurate), the smallest number of widely-circulated American coins that could be used to pay for the same purchase is eight. And who feels anything less than awkward and juvenile when you reach into your wallet to pay for your peanut M&Ms and can of soda, only to come up with a handful of quarters? No. Just walk away, my friend, just walk away. Your coins are no good here, 6-year-old-kid with sticky hands and glasses. Go get your mother to pay for your gluttony–or whip out a credit card to hide your junk food shame under the protection of an ‘adult’ payment method. 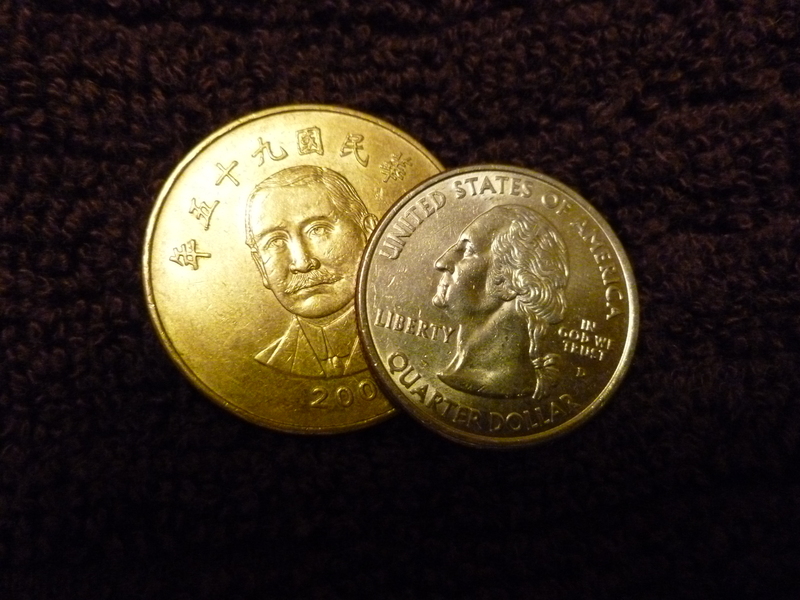 In Australia and Japan, I was bemused and charmed by the larger-valued coins in common use. (Until I went to exchange money, that is, and was reminded that almost no one will change coins, no matter their worth. Incidentally, if anyone wants to buy a ¥ 500 coin…) Australians commonly use $1 and $2 coins–and while I would point out here the strangeness of a $2 coin being smaller than the $1 one, both weigh significantly more than the smaller values or than American coins in general, so I’m going to have to give them a pass. After all, at least they do have useable coin values in common circulation–American lawmakers wish they could say the same. Sigh. If only American coins made sense, and came in ordinary, useable amounts, maybe people would go back to using cash. And, call me a Luddite, but there’s something special about feeling the physical weight of your money before you spend it–it makes the whole ritual seem a bit more real than the facile swipe of a card. If the weight of a quarter were just a bit heavier, maybe Americans would take just a moment more before flinging it across the counter for a load of trash. This entry was posted in America, Culture, Life, Travel and tagged America, American dollars, Australia, Australian dollars, Cairns, coins, culture, currency, differences, dimes, Japanese yen, money, New Taiwan dollars, nickels, pennies, quarters, Taiwan, Thai baht by bekahgraham. Bookmark the permalink.